Last night, while listing auctions on my banker, I saw an advert in trade channel for a raid on the horde bosses. Eh, I usually ignore them because they're usually too disorganized and/or there aren't enough people. Then I see two more people right after that looking for more for the same raid. So I awoke Tiddly, inquired as to the status, and got one of the last 5 spots in the raid. And we were off. We started in Azshara and then rode south on the river thanks to some Death Knights and we invaded Orgrimmar with little to no resistance. 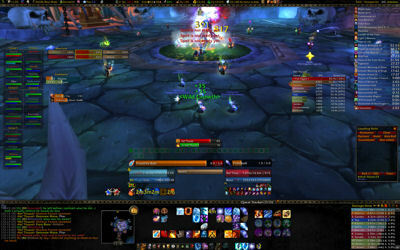 I quickly set a portal up after we downed Thrall and we reformed in Theramore and went to assault Thunder Bluff. With that done, we quickly moved on Silvermoon via the Zul'Aman flight point and then we just had Undercity left after flying to Chillwind Point. It took us some time to get all 40 people gathered up and ready to go at each position, but we were quick enough within each city, met little to no resistance, and we downed the four bosses, and I have my Black War Bear - mount #73 (and I blew by 5,500 achievement points). Tonight, the Gold Team is again looking for achievements. We'll be looking to do Malygos with 8 people and then we will give Sartharion + 3 drakes our first attempt. Hopefully all goes well. I believe we'll be going in with 3 tanks, 2.5 healers, and then 4.5 DPS. Go go go! It's pretty similar to the UIs I've used in the past, but a few small changes have been updated. Across the top is the standard FuBar (note: since the screenshot, I've collapsed most of the FuBar plugins to icons only), with a flight timer, boss mods, decursive, etc. There's a gold monitor, item repair status, bag space, friends online, guild members online, grey items to drop, faction tracker, and tradeskill tracker. At the bottom I've got my chat window on the left, a simple map, button bars, and then damage meters on the far right. Nothing too outrageous. Ignore the quest tracker down there - it has since been replaced by another quest mod. Just too many issues with BEQL. Over along the left, I have quick access to all my party members and Ora2 tank setups, cooldowns, and then deadly boss mods sit over there until they get closer to expiration and then they move to the middle right next to Scorchio. It's nice to just use the standard built-in raid UI to pull out the groups. Gives me a quick overview of who is alive, dead, or dying. At the top is Scorchio - an amazing mod that tracks my living bomb and scorches on the target. I don't know what my DPS would do without it. The buttons below are Decursive and allow me easy decursing and sheeping during mind controls. There's a little green box you might be able to see over to the left of Decursive - that's BuffEnough - another great mod. Turns green when you are completely buffed, turns yellow when buffs are about to expire, and turns red when buffs are missing. Below the Decursive boxes, there's Quartz for my timer bars. Here you see me catching Frostfire Bolt while Kel'Thuzad is casting a frostbolt. Underneath that, I'm using Pitbull for my other panels. It's a pretty simple setup using the standard "Blizzard" shading instead of the "BantoBar" it was using before. It's me on the left, my target on the right, and the target of my target in the middle (thankfully it's the tank here). If I'm using a focus, that appears next to my target on the right and my focus' target appears above it. If I have a pet, it appears to the left of my name and my pet's target appears above it. Both the focus and the pet have their own Quartz cast bars. Over on the right, we have Omen to monitor threat (I had tried placing it down next to the damage meters, but I need to watch it too much to have it down on the bottom of the screen, so there it is, right in the middle on the left). Then we have Elkano's Buff Bars going down the right side and LootHog beneath it. I have to run LootHog because, as you may have noticed on my character bar, I'm the loot master. Yay! Other miscellaneous things: Sunn Viewport Art is amazing. It provides the nice backgrounds behind my top and bottom bars and also adjusts my viewport so my video card doesn't have to render graphics where I don't need to see. Which gives a few FPS boost I'm sure. I'm pulling 21 fps in the screenshot above - that's about as low as it goes during normal 25 man raiding. Thank you nVidia GTX 260. Oh yeah, I use the built in scrolling combat text with arcs to move things up and away from my character. I found I needed the arcs because sometimes death knights or others spam abilities that cause lots of scrolling combat spam, so this works the best. Sheepage FTW. Bound to "G" key. Target my sheep target and hit "G" - if in range, it will set focus and sheep. If out of range, just sets focus. Now I have my sheep target focused and on screen at all times (next to my target as I stated above) and I can see when it breaks, or if it changes targets. If need be, I can just switch sheep targets with an ALT+G combo. The sheep will also change without the ALT modifier if my previous sheep focus is dead or doesn't exist anymore. I know it's simple, but it's necessary. I have it bound to the scroll down on my trackball scroll wheel. It allows me to quickly silence anyone, even if I'm casting something already. Works like a charm. My standard eat strudel button. Right click to conjure food, left click to eat. Easy, but effective. My newest one. I love it. All-out-DPS in one click. Uses my Mana Gem for a DPS bonus (thank you two piece tier 7), Combustion for extra crit, Icy Veins for fast casting, Mirror Image for a little extra DPS (not much, but it's something), and then lastly, if I right click, it conjures my mana gem. By default, because "Mana Sapphire" is first in the rotation, it shows me how many charges I have left and the cooldown on the mana gem. As you might be able to see in my overall screenshot, it's right below my name plate. But to the left of it, I have individual buttons for Combustion, Icy Veins, Mirror Image, and the Mana Gem on its own. Since they all have different cooldowns, I have access to all of them individually to maximize DPS - though I just love hitting the one button at the start of a fight to get that DPS flowing. Another pretty simple macro, but it is bound to "R" and allows me to cast Ice Block quickly and easily. It cancels any spell I might be casting and throws me in an Ice Block. Then, quickly and easily, if I hit "R" again, I get out of my Ice Block. Comes in handy when the threat dissipates and I want to get back to DPS, or in PvP when people have Ice Block timers, I can break early and surprise them. This one I used over the weekend to allow me to see how many Tastyfish I have in my bags during the fishing tourney. Simply brilliant, thanks El's Anglin! Of course, if you have any questions, suggestions, or ideas, let me know as my UI is constantly evolving. # Improved Scorch: In addition to the stacking crit debuff, will improve your critical strike chance with Fireball, Scorch or Frostfire Bolt by 1/2/3%. Standard "no promises" caveat applies. If this does come to fruition, it will be a very nice change. Instead of our standard 5% scorch debuff once the patch goes live, we'll get the 5% debuff raid wide to help everyone out and then an additional 3% to help our own damage. Very nice. Hopefully this change does come through and not be thrown by the wayside. On another note, last night Vetarra and I snuck into Serpentshrine Cavern to fish up the Lurker Below. I was able to almost make it to his platform without any problems as I used invisibility to get by some mobs and was able to just walk in front of others since they're level 71 and me 80. However, those darn fish in the water made quick work of me, eating through my mana shield and just as I was about to make it to the platform, they killed me. Luckily I had a stealthy druid there to scoop me up, and after one more hopping session, we made it. I fished up the Lurker on my third cast and with Vetarra shadowmelded, I popped invisibility. And while it saved me, his water blast took out Vetarra even though she was hidden. So she had to stealth back again, I threw up a portal to Shattrath, and she got to fish up the big fish again and we quickly ported out of there before he could get us. So that leaves me with just one more achievement to go. I am coming for you Dark Herring! The past few days, maybe the past few weeks, I've been working to rebuild my reputation with the goblins of Azeroth. To do so, I've been buying up tons of linen and silk off of the auction house whenever it's at a sane price and then turning them in to the goblins of Ratchet and Booty Bay. After 168 stacks of linen, I was working on silk and came up a stack short. So I went off to the west, slaughtered a few bloodsails (yes, they had to feel my wrath in order to have my reputation with the goblins restored) and I turned in the final stacks of silk and red dye at about 1:45 on Sunday. Then, I was reminded by someone in Booty Bay that the fishing tournament was coming up at 2:00 so I headed out to the coast, staked out a spot and waited for it to begin. I started quite nicely in my own little cove with very few people bothering me while fishing up my Tastyfish. Eventually a few people wandered over, so when the pools were depleted, I headed south a bit. I found another nice cove which people weren't using (perhaps because it has one of those "unfishable" pools), and I was able to get some more Tastyfish at a quick rate. As my quota of 40 fish was approaching, some more people moved in on my turf and I was forced to head north a bit. As I hit 39 fish, no one had won yet and I was amazed at my luck. I hadn't participated in the tournament for ages due to the goblins of Booty Bay attacking me if I got too close to their city, let alone turn in Tastyfish. So I sent out one more cast in a newly discovered pool that someone else had happened upon as well. Stranglekelp! Drats. I knew if I was close, there had to be many others close to 40 as well. Cast #2, I was thinking, "please let this pool not disappear before a fish bites..." and there it was, Tastyfish #40. I couldn't believe it. I had 40 Tastyfish and there had been no winner announced. I had been close in previous tournaments, but never this close. Quick, the hearthstone! 10 seconds later, I was back in Booty Bay. The fishing tournament is mine! I quickly exited the inn, blinked over to the tournament organizer and presented him with my 40 fish. Success! A new fishing pole was rewarded, my name was announced throughout Stranglethorn Vale as the winner, and a new achievement was mine for the taking! And then I saw him, a poor paladin of 76 seasons. He stood right next to me and was dejected. He had also just hearthed back to Booty Bay and was about to turn his fish in when I blinked by him on my way from the inn to the organizer. Perhaps next week he will be able to win the tournament. After all, he had probably used his Crusader Aura to travel from school to school, so it's only right that I could use my blink. So here I sit, two achievements away from being Salty Tiddlywinks. I need to fish up the Lurker Below in Serpentshrine Cavern and I need to fish up a very rare fish. I've spent a few hours in the Howling Fjord already trying to get a Dark Herring, but he still eludes me. I figure once that Herring is gotten, I'll enlist my 10 man team to go clear the way to the Lurker, port them all out of the instance, and fish him up by myself to gain the new title. Then, there will be one last thing left to do. I'll have to fish up the one fish that still eludes me after thousands of casts...Old Ironjaw. I'm coming for you! You can't hide in that pool forever.